Several years ago, my wife and I were visiting a church whose worship style and dress code were quite different than that to which we were accustomed. At that time, I typically wore a coat and tie when attending Sunday morning worship. As I looked around the congregation that morning, not a tie was to be seen. The music portion of the service was much more “contemporary” than the “traditional” early service I was comfortable with at my own church. All of these things were distracting enough on their own. But when a young man and his wife sat down in front of us, the first thing I noticed was the baseball cap on his head, the Dallas Cowboys shirt he was wearing, and the sandals on his feet. When the pastor began his message, this young man appeared to be totally uninterested in what was being said, pulling out an electronic device to do something else …. Or so I thought! As I craned my neck to see what was so important to him on that tablet, he was highlighting the passage we were studying on his electronic version of the Bible and recording notes from the pastor’s comments. Suddenly, the Holy Spirit convicted me of allowing the distraction of a disputable matter like proper dress keep me from hearing what God was speaking to my heart, while this young man was completely engaged. In his letter to the Romans, Paul addresses a church that had experienced some major disruptions in its church culture. Predominantly, the church at Rome was composed of Gentile believers at the time of Paul’s writing. But after the reign of Claudius, who had expelled all Jews from Rome, (Acts 18:2) Jewish believers began to return. Most of the New Testament churches began with Jewish believers. As the Gentiles began to join those churches, a major problem that Paul had to address was the influence of Judaizers – former Jewish leaders who insisted that Gentile believers follow many of the requirements of the Jewish law. This led to a major council at Jerusalem as described in Acts 15 to determine what, if any, those requirements would be. Today he might add that the kingdom of God is also not a matter of dress code, musical preference, preferred Bible translation, or the manner in which we access that translation. Christians of my generation often stubbornly resist the evolution of worship styles being driven by the preferences of the younger generations. We tend to gravitate to our comfort zones, separating ourselves from those generations with our “traditional” services versus their “contemporary” services. By doing so, I wonder if we’re not repeating the mistake of the Romans. Are we focusing too much on disputable matters and thereby disrupting the unity of the Body of Christ? Are we depriving ourselves of the mutual benefits of multiple generations worshiping together, preserving the foundations of our past, while also being nourished by the enthusiasm and spiritual energy I see in so many young people today. Most importantly, are we undermining God’s work and hindering the growth of the church and its impact on the ever-changing culture when we resist the inevitable changes that are occurring. As I reflect on my encounter with that young man sitting in front of me that Sunday morning, I wonder whose faith was weak – his or mine? As I understand Paul’s implications in this passage, I suspect that it was mine. I also wonder now what Bible passage the pastor was preaching that morning. Perhaps it was Romans 14 and I was so busy judging that man’s appearance that I completely missed what God was saying to me. And by the way, except for the occasional wedding, funeral, or visit to the church our son pastors, I have not worn a tie to church in almost four years. In recent days leading up to the inauguration of our new president, I have been reflecting quite a bit on these words of the psalmist. We do not know the specific circumstances which prompted his cautions against trusting in princes, but its implications are eternal. The Bible records numerous examples of Israel turning their backs on God while overly trusting in men. In spite of consistently devastating results, all too often we continue to make the same mistake. Eight years ago, President Obama came to office promising “hope and change” in the midst of widespread financial calamity and skyrocketing unemployment. While those conditions improved greatly during his two terms, our political divisions intensified. In his inaugural address yesterday, our new president made little attempt to heal those divides, instead employing exaggerated and dystopian rhetoric to describe an “American carnage” where our children are “deprived of all knowledge”. Wherever you may stand in your views of Donald Trump or Barack Obama, we should all reflect on the words of Psalm 146, reminding ourselves that no matter how powerful and charismatic and no matter how convincing their rhetoric, trusting in man is a misplaced trust. 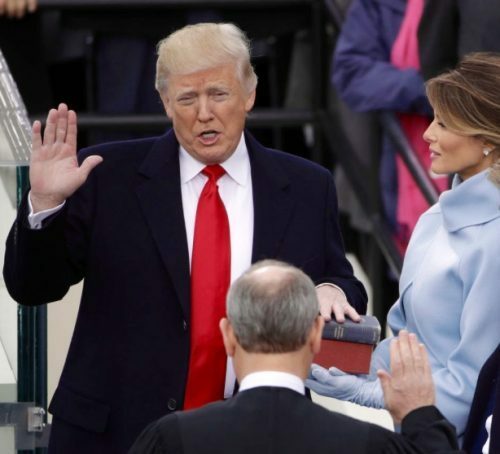 Those eagerly counting on President Trump to make good on his promise to “Make America Great Again” as well as those who exceedingly fear him are both placing too much trust in the plans of men and too little trust in the overriding sovereignty of God, who alone “remains faithful forever”. That is why I continue to abhor mixing religion and politics. Inevitably it takes our focus off of the only One who can truly save. As followers of Christ, when we overly involve ourselves in political endeavors, we risk the impact of our central message, the Gospel of Jesus Christ. Polls continue to reveal that the more vocal Christians have become in the political arena over the past several decades, the more negatively we are being viewed by the general public. That trend will likely be magnified by this divisive election. As Christ’s ambassadors, we have been commissioned to spread a powerful message – a message too important and too life-changing to allow political involvement to threaten the impact of our witness. Our Lord is still “able to do immeasurably more than all we ask or imagine, according to his power that is at work within us.” (Ephesians 3:20 NIV) If more of us would lend the same enthusiasm and energy to spreading that message as we bring to spreading our political messages, the collective impact on future generations of that “hope and change” might astound us all! Only hearts changed by the Gospel will bring about the change that God seeks. May we focus on that message. May we be faithful to that Commission. Make we seek to make that Kingdom great and to make that Kingdom come on earth as it is in heaven. 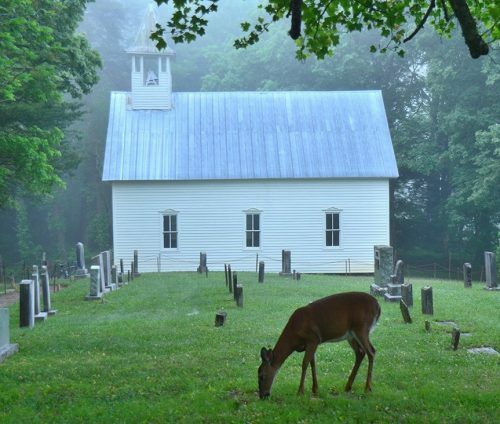 I grew up on a 96-acre farm just outside the small town of Jenkinsburg, Georgia. As I look back on my life, I realize that some of my greatest life lessons were learned in those formative years on that farm. 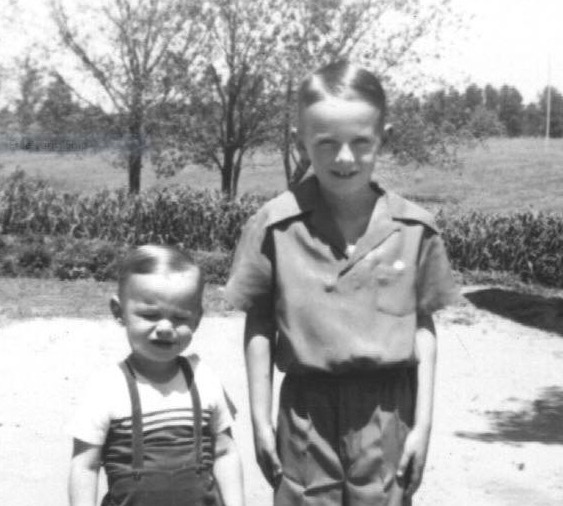 I recounted one of those lessons when I preached the funeral of my big brother, Ronnie, who went home to be with the Lord on this day two years ago. When he was about ten years old, Ronnie decided to build a tree house in one of the oak trees in our yard. Upon its completion, he couldn’t wait to show off his handiwork. In spite of my reservations about his construction skills, he finally convinced me to climb up there with him. No sooner had those words left his mouth than the limb it rested upon started to give way, and Ronnie crashed to the ground with it. As for me, I was still holding on to that overhanging limb for dear life, while he lay dazed on the ground. Ignoring his own pain and disorientation, somehow Ronnie climbed back up that tree and helped me down to safety. As I look back on that experience, the lesson that stands out with me is this – a structure is only as good as its foundation. That tree house was well-built. Like all the men in our family, Ronnie was a perfectionist. But the foundation upon which that tree house rested was not a solid foundation. And the force of Ronnie’s jumping up and down was more stress than it could bear. Another treehouse stands today not far from the site of that original one from so many years ago. 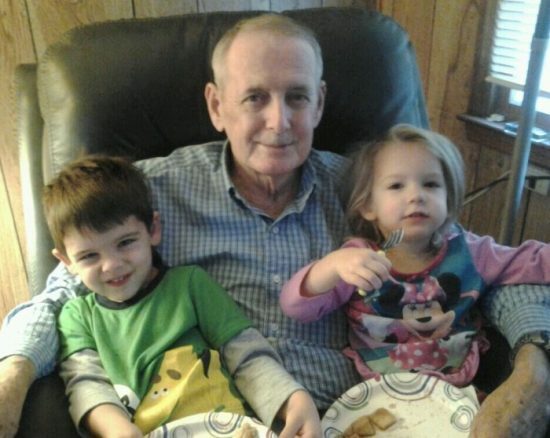 Located at the end of a path Ronnie cleared before the Lord called him home, it belongs to his two precious grandchildren, Owen and Nora, who were the light of his life through those last difficult years. Unlike his treehouse, theirs is professionally constructed with added features like a trap door, a fireman’s pole, and even a zipline. Note: This is an updated version of “Lessons From The Tree House” first published Feb. 20, 2015. The fact that these verses are found in the middle of a book whose title, Lamentations, means “funeral songs” speaks volumes. In the midst of seemingly unbearable sorrow, Jeremiah never took his eyes off the Lord in whom he found hope and comfort. Even as the smoke was still rising from the ashes of Jerusalem, he chose to focus on God’s unfailing love, compassion, mercy, and faithfulness. These verses immediately sprang to mind yesterday morning as I gazed out my back door. Through the years, I have witnessed many awe-inspiring sunsets over the mountains to the west of our home, but rarely have I witnessed such a breathtaking sunrise. 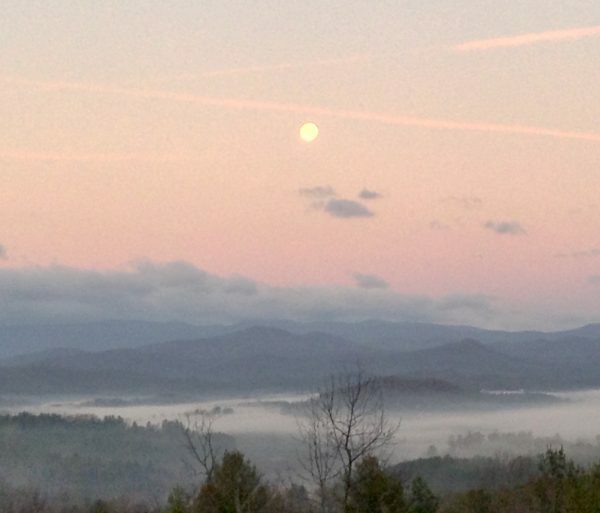 My limited photography skills and equipment prevented me from adequately capturing the matchless beauty of the full moon nestled over the mountains with the morning mists settled in the valley below, while the first rays of the sunrise painted the sky pink as they kissed the peaks of the Blue Ridge. Nor are my writing skills adequate to convey the impact of that celestial scene on my heart. In Psalm 19:1, David writes, “The heavens declare the glory of God; the skies proclaim the work of his hands.” (NIV) I am richly blessed to live where God’s handiwork is on constant display just outside my back door. On a cloudless night, I can gaze up at the stars and sense that our universe, like its designer, is mysteriously infinite and in many ways beyond my comprehension. And yet, as daylight approaches, scenes like this continually remind me that my Creator is also close, like an enveloping blanket. While our world at times seems like it is coming apart at the seams, those first rays of dawn remind me every morning that I worship a God who is perfect in his love, infinite in his wisdom, sovereign in his control, and as faithful as the sunrise. How can anyone not trust a God like that? These “health rules” are simple, clear, straightforward, and unchanged for over 2,000 years. In fact, they were first articulated just as they are presented here by Hippocrates, a Greek physician who lived several hundred years before the birth of Christ. Rather than chase the latest fad, save yourself some money this year, ingrain these few timeless principles into your heart, and discipline yourself to follow them. The same applies to our approach to spiritual health. Walk in the door of any Christian bookstore and you will be immediately confronted with the latest bestseller by your favorite Christian author with his/her face prominently displayed on the cover promising “Your Best Life Now” or “30 Days to Spiritual Maturity”. You will likely encounter a wide assortment of devotionals offering nuggets of Biblical wisdom and spiritual insight for each day of 2017. You will have no difficulty finding these publications. They will be prominently displayed out front. But you may need a little assistance if you’re actually looking for a Bible. They will usually be tucked off to the side somewhere out of the way. Sadly, that is too often the case in our homes as well. 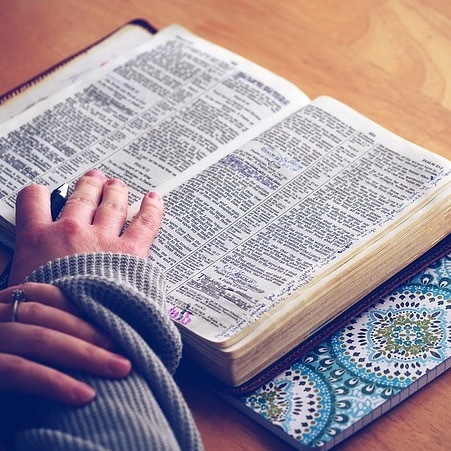 Devotionals, Christian books, and religious blogs such as this one serve a useful purpose and my comments are not meant to denigrate them in any way or discourage you from reading them. (Certainly not mine!) But if they are your primary source of spiritual food, you will be woefully malnourished. If your goal is a stronger relationship with the Lord and improved spiritual fitness in 2017, there is simply no substitute for spending undistracted, quiet time in God’s Word. If it is not already your practice, I encourage you to resolve this year to begin each day reading and prayerfully digesting the clear, straightforward, and timeless truths found in the pages of your Bible. Ingrain its teachings into your heart and apply its principles in your life. There is simply no better source for spiritual nourishment and guidance than a clear word straight from the heart of the Creator and controller of the universe.